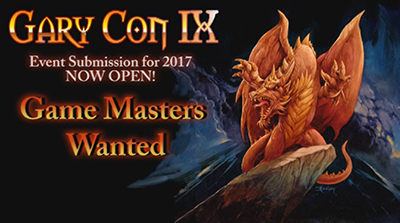 NOW is the time to submit your games and events for Gary Con IX! Early submission maximizes your GM rewards and puts you early in line for prime tables and time slots. To submit games to run at Gary Con Click here use the Tabletop events page. You will need to log into the account attached to your badge to host events. For detail instructions, visit the event submission instructions page. Game Masters are a back-bone element that makes Gary Con great. Thank you for bringing your experience and games to Gary Con IX.